GOOD MORNING AMERICA – Five high school students are surprised live on “Good Morning America’’ in New York City Monday, Jan. 15, 2018 with the announcement that they were selected to be part of this year’s exclusive Disney Dreamers Academy event with Steve Harvey and ESSENCE Magazine at Walt Disney World in Florida. The students include Ayanna Adams of Los Angeles; Christiana Okafor of Houston; Marquis Thomas of Virginia Beach, Va.; Ava Marie Easter of Los Angeles and Sean Smith of Basking Ridge, N.J. In March, as part of Disney Dreamers Academy, a total of 100 pre-selected students known as “Disney Dreamers,” will embark on a journey throughout the Walt Disney World theme parks for a fun and educational experience to discover new careers and pursue their dreams. 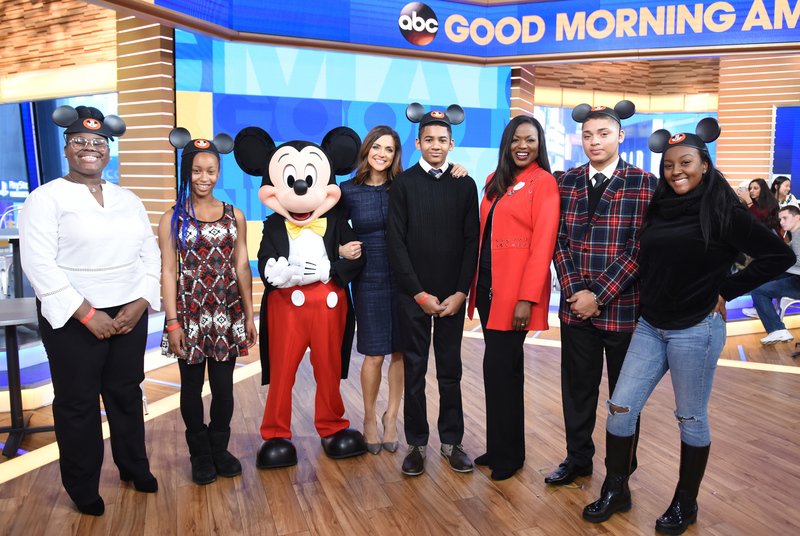 Five high school students were surprised live on “Good Morning America’’ with the announcement that they were selected to be part of the exclusive Disney Dreamers Academy with Steve Harvey and ESSENCE Magazine. Participating students, known as “Disney Dreamers,” embark on a journey throughout the Disney theme parks and behind the scenes, turning the vacation destination into a vibrant classroom for students to discover new careers, pursue their dreams and interact with Harvey and other motivational speakers and celebrities. Among the celebrities who have participated in the past are singers Patti LaBelle and Mary J. Blige, NBA legend and business mogul Magic Johnson, gospel music star Yolanda Adams, NFL superstar Cam Newton, plus TV personalities such as “The Chew’’ co-host Carla Hall, “Good Morning America’’ co-anchor Michael Strahan and ABC correspondent T.J. Holmes. Ayanna Adams, 16 – Los Angeles – Adams’s father was incarcerated when she was 6. Inspired by her mother’s work ethic and commitment, Adams started working at 13 to help support her family. Despite juggling work and school, Adams currently holds a 3.2 GPA and dreams of going to college to earn a job that will allow her to take care of her mother. Ava Marie Easter, 14 – Los Angeles – Easter is both an accomplished student and dancer. Despite her family experiencing homelessness in the past, Easter’s spirit has always remained strong. She has earned acceptance to both the LA County High School for the Arts and Millennium Dance Complex to pursue her passion. She dreams of going to Julliard and studying biology at Columbia and Barnard. Christiana Okafor, 16 – Houston – Okafor dreams of becoming a doctor, graduating as valedictorian and attending an Ivy League School. Currently, she has a 4.3 GPA and is involved in numerous extracurricular activities. She was recently nominated to represent her home state of Texas at the Congress of Future Medical Leaders. Inspired by speakers at the conference, she hopes to one day make breakthroughs to help those suffering from autoimmune diseases with no cure. Marquis Thomas, 15 – Virginia Beach, Va. – Recognized as the Virginia Beach Youth of the Year for his work in the local Police Explorers program, Thomas dreams of working in law enforcement. He is inspired to fight crime after the uncle that served as a father figure to him was killed. Sean Smith, 14 – Basking Ridge, N.J. – An encounter with a real-life war hero inspired Smith to pursue a career in aviation. He attended an event where Tuskegee Airman Eugene Robinson was a speaker. After the event, Robinson gave Smith the uniform hat off his head and signed it. That moment led Smith to follow in the footsteps of the Tuskegee Airmen and he has been taking flight lessons since 6th grade and is a member of his local aerospace club.